I had an interesting dialogue with a reader of my blog at Huffington Post Alberta this week. The reader was commenting on my recent article there, an article about the recent visits of Bill Cosby and Malcolm Gladwell through the Northern Insights speaker series. The title of the piece is "What the Hell is Going On in Fort McMurray", and this reader responded initially with two brief words: "nothing good". As the discussion evolved what became clear to me is this is someone who has an issue with the industry in this region, but who has allowed that view of industry to taint their view of the community. They seemed to have trouble distinguishing between the two, an inability to see that industry and community are not the same, and are separate entities. I was both bemused and bothered by this, because I think at times we have the same problem right here within our community. I think we are not always so good at separating the two, and if we cannot do it then how can we expect others from outside to do it? Look, industry is important. It is vital, of course, whether that industry is the oil sands in this region or gold mining in Red Lake Ontario or nickel mining or pulp and paper mills or automobile manufacturing or...well, the list goes on. 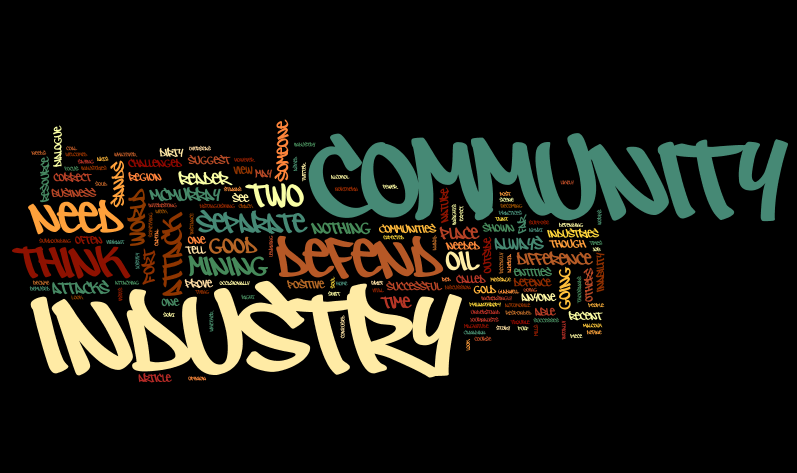 However, none of those industries are the same thing as the community in which they are found. 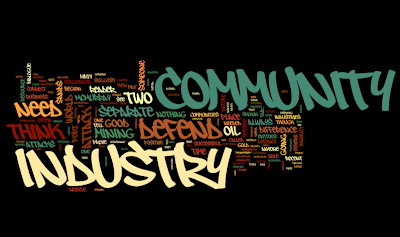 Communities, whatever their industry, exist separate and apart from the industry. One of our local journalists commented recently on Twitter that when someone attacks industry they are not attacking community, and that we need to be able to tell the difference - and she is correct in my opinion. Industries, of any sort, will always be challenged and asked to defend themselves, and any resource industry is often challenged (look at gold mining or coal mining, for instance, or diamond mining overseas). That is the nature of business, and those challenges are not only expected by industry but often welcomed as it gives them the opportunity to share their stories and successes. The difference is that an attack on industry is not an attack on community, and we need to be able to separate the two. Saying that the oil sands are a "dirty business" and are "ruining the earth" is not the same as saying "Fort McMurray is a dirty place full of crack and alcohol". One is an attack on industry, and one is an attack on community. And while the industry might need to defend itself and prove to others that they are developing the resource in a responsible way I am going to suggest something. I am going to suggest that we, as a community, have nothing to defend. We do not have to prove ourselves to anyone. I suppose there was a time when that defence of community was needed, and when every attack on community needed to be fought. I think, though, that time is waning. I think we are becoming increasingly successful at sharing our positive story with the world, and I sense a shift in the dialogue surrounding this place. I see far fewer of these attacks on our community, and far more who focus their concerns on the industry. I think the positive message about our community has been successful, and I think the outside world is learning that our community is not the same as our industry, and that the two are separate entities. Industry will likely always need to defend itself, and not just the oil sands industry. Most industries are called upon at one time or another to defend their practices and to justify what they do, and truly that is the nature of the world. Community, though? Communities don't need to defend themselves, and when someone attacks us because they have confused our community with our industry they have shown their inability to separate the two. They have shown that they do not understand the difference between industry and community, and while we may want to correct them on that point I don't think we need to defend the community to them. This community has nothing to defend. This community stands on good solid ground as evidenced by the thousands of people who call this place home, and the magnitude of the good works we do, from being the Canadian per capita capital of philanthropy to our vibrant arts scene to our award winning students. While industry may occasionally be called on the carpet to defend themselves and their work I think we as a community have no need to do so. We are not an industry. It does not define who we are. It is our job, and not our soul. If we are going to tell the world that we are more than oil than we need to believe it and stop defending that which needs no defence. We are Fort McMurray. We are more than oil. We are a community. And we need not defend that to anyone ever again. Period. Brilliant! Love it! Separation of community and industry, yes! Excellent!!!! So well said and so true!!!! We are not our jobs, we are our family, and friends and what we do in, or for our town. My work life and home life are two VERY different worlds. I work at a work camp front desk and a man who was checking in exclaimed that he was "back in Fort McToilet" to my co-worker and I...WRONG MOVE!!! We adamantly defended our home and asked him when the last time was that he actually hung out in town. He NEVER goes to town and was only judging by the camp sites he stays in. TWO VERY DIFFERENT PLACES!!!! Well said. This is a topic I've been grappling with for some time now actually. There were times I wanted to blog about it but wasn't quite sure just how to say it. My own experience is that the most negative people tend to be those who only work in camp for short periods and then leave. I was greatly relieved a couple weeks ago when a guy who waited at my bus stop for another project finally took a job elsewhere. Each morning, following a perfunctory "hello" he would follow up with a tiresome monologue on how "boring" the city was, how there was "no life here" and how he couldn't wait to move on etc. etc. and there were many days I regretted when my bus was late. Generally, I find those I work with in town a bit more positive. To people who complain they find the city boring, I gently suggest that perhaps it's because its they who are boring and they need to make more of an effort. Feeling Alone in Wood Buffalo?